LONDON: Police in England and Wales are being given greater stop and search powers to tackle rising knife crime. It comes after fatal stabbings rose last year to the highest point since records began, BBC has reported but campaigners said the move was “disappointing and regressive” and that stop and search is not effective. 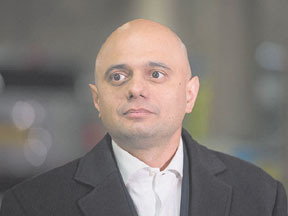 File photo dated 30/1/2019 of Sajid Javid, who has demanded that social media companies step up efforts to remove online content that fuels knife violence. The change is being trialled in seven police force areas where more than 60% of knife crime occurs: London, the West Midlands, Merseyside, South Yorkshire, West Yorkshire, South Wales and Greater Manchester. It makes it easier to use so-called “section 60” checks, where for a limited period of time officers can search anyone in a certain area to prevent violent crime. Section 60 has been used at large events such as Notting Hill Carnival last year and after violent incidents such as the stabbing of a man outside Clapham Common Underground station on Friday. Other powers which account for the majority of searches will remain the same, and will still require officers to have reasonable suspicion of an offence.